Laurent Jeanneau and Shi Tanding have returned from the northwest corner of China’s Xinjiang province with an amazing batch of recordings collected during the weeks leading up to the volatile Uyghur uprising of 2009. Armed with their trusty audio gear, the couple was set on getting married and recording various styles of regional ethnic music near the Chinese border with Kazakhstan. However the local authorities suspected that the pair had other intentions, shadowing and interrogating them wherever they went. 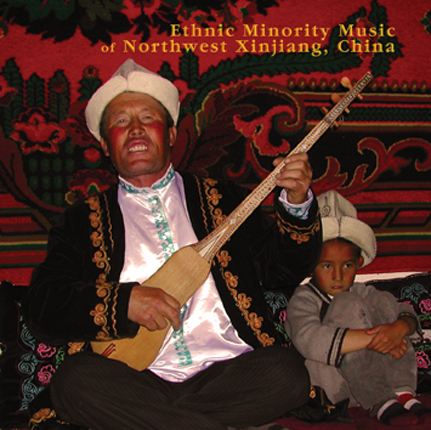 Their marriage in Shi Tanding’s home town of Ili would have to wait for another time (the marriage documents were delayed in processing deep within the Chinese bureaucracy) but the recordings, preserved here, display several magnificent and unique varieties of traditional Islamic folk music with traces of Arabic, Persian, and Turkish influences heard throughout. The players are Kazakh, Uyghur, Kirgiz and Mongol Erut musicians performing on a wide array of local stringed instruments including topchar, komuz, rushtar, rawab and tchang. One amazing example is Kurmanjiang Zaccharia, a Kazakh string virtuoso, whose lightning fast fingers blaze up and down the neck of his two-stringed dongbra. Another is an epic 10 minute vocal muqam performed by a trio of Uyghur musicians on satar, tambur and dotar. Also featured is a Kazakh singing style called Ay Ikesse performed by Aken (improvising poet-singers utilizing dongbra accompaniment), Kirgiz songs sung in the Manas Style and played on the Komuz, and Mongol Erut bai boor den instrumental pieces. The CD comes with a 16 page full color booklet featuring photos of the musicians and informative liner notes chronicling the journey, instruments and styles documented, and background information on the performers by Laurent Jeanneau.